Sixteen Senators have tendered resignation letters giving up positions they occupy that are incompatible with the office of Senator. They informed the upper house of Parliament of the decision during a plenary session chaired by eldest member, Fon Victor Mukete. Four verification boards that were set up shortly after the plenary marking the start of the second legislative period identified sixteen cases of incompartibility. All sixteen Senator gave up their duties and opted to hold on to their position as Senators. The reports were presented by the Reporteurs of each of the verification boards. #Senator Aboubakary Abdoulaye, resigned from his position Chairman of the Board of Directors of the Urban and Rural Land Development Board and Chairman of Board of Directors of FAO/WFP Management Committee. #Mrs Afane Gisele Solange Bidjang, civil servant stepdown from her post of Head Mistress of Presidential Guard Nursery School Group A. #Amrakaye Martin, civil servant also resigned from duty at Maroua District Hospital. #Baroua Nyakeu, Contract worker, Deputy Controller No 2 at the Divisional Delegation of Public Contract for Djerem suspended his contract. #Didjiatou Oumarou, municipal treasurer at Marouare Council left the job. 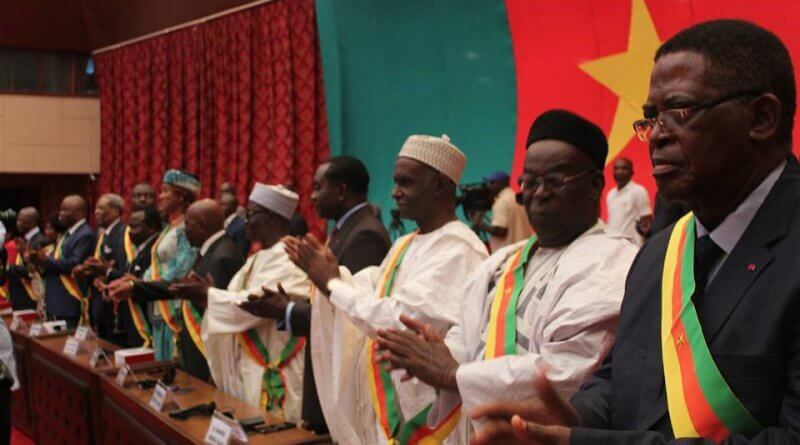 #Hamadou Paul, Chairman of Board of Directors of Cameroon Publi Expansion also gave preference to the Senate. #Mamoudou Mazadou, civil servant, General Supervisor at Tignere District Hospital and Mrs #Ngangoube Aminatou, Municipal Treasurer at Koutaba Council also resigned. In all, the 100 Senators are set to receive their accoutrements comprising; an insignia, a tricolour Sachs and a cockade during a plenary session this Wednesday, 2nd May 2018 at 2pm.